This .357 semi-automatic revolver delivers a realistic look and feel just like the real thing, delivering a velocity of up to 435 feet per second! The realistic design features a comfortable finger/groove grip and offers both single and double action, making it ideal for action shooting. 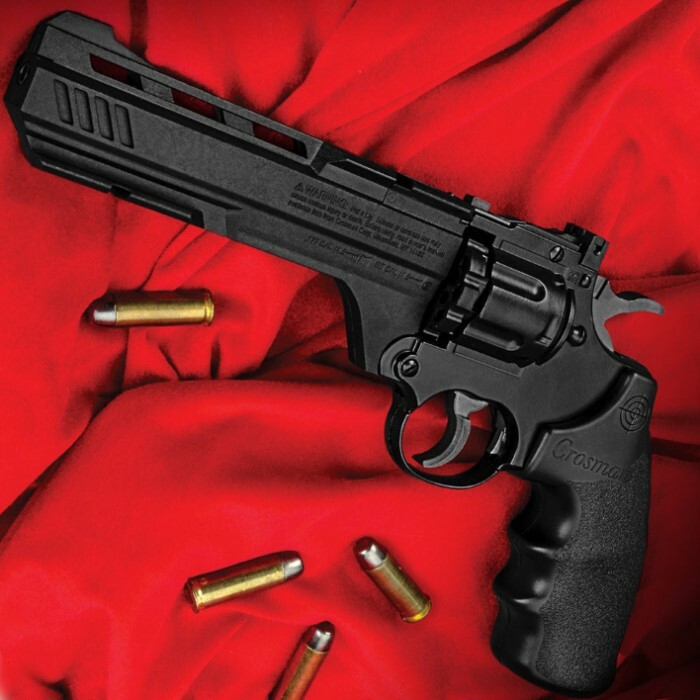 True to the real-deal revolver's design, this air pistol has a full metal frame with a 6" rifled steel barrel for pin-point accuracy, an innovative tactical rail system, and an adjustable rear sight. It features a 6-shot clip for shooting BBs and a 10-shot clip for pellets. Fire away with this Crossman .357 Magnum CO2 air pistol! I have been a fan of Crossman products since I was a young man raised on our farm in NE Nebraska. My Crossman 357 has been so dependable I have just ordered another pistol from BudK. I just took my tried and true c-man .357 out 2 days ago, I have had this for over 23 years, YES you read that correctly! If nothing else it Shoots better now than it did brand new! This is the exact same gun except for a few cosmetic changes. Mine has a golden trigger and it does NOT have the under barrel mount for a flashlight/Laser/Red Dot finder. I have out shot pistols costing over 3 times as much as this, after the shoot I had several members ask me where they could get one! The Weight and Balance of these feel just like the real thing. Make sure and order more of the ammo cylinders for it, you will be glad you did. This is also pretty easy on the gas. much more so than my CO2 rifle. These are exceptionally powerful and get more accurate after you put a couple thousand rounds through it. I can put 5 shots in a nickle sized circle at 25 feet! On a fresh CO2 Cart it still fires over 415 fps on a crono, if you use Sig Pellets it jumps up to 429 fps!!! The later arent as tight so fire faster. I have found accuracy isn't quite as good as my premo pellets but still better than most co2 pistols. Take very good care of this gun and it will last for years. I always clean it with my .17 HMR cleaning kit, swab the barrel with Rem Oil, I also do not leave a COT cart. seated long term. I fire it for a couple days until it is about of gas then unscrew the CO2 and put a lite ring of quality gun oil on the seals, and put a lite coat of Rem oil on the whole pistol. I guarantee you will not be anything but 100% tickled to death with this pistol. Easily punches through a soup can. I hope Crossman never retires this model. If I hear of it I will buy 2 to make sure I have one for the rest of my life. 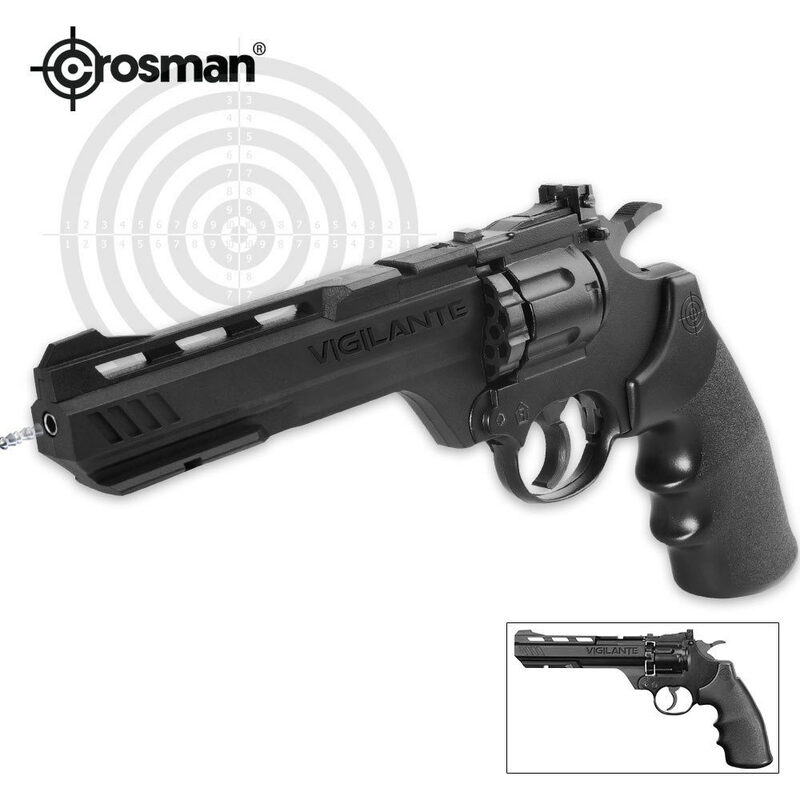 It's the famous Crosman Vigilante... 10 shots of 177 pellets. 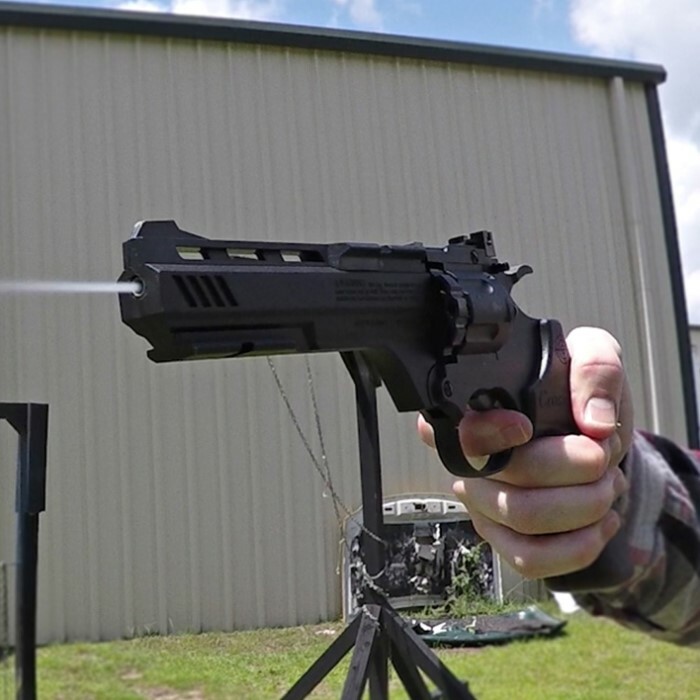 This gun actually shoots much further than demonstrated in the video. I added a Bushnell 1 X 40 red dot and it friggin awesome.... ! Buy some extra clips and be sure to use Umarex High-Grade 17 gr CO2 cartridges.,,,, and clean the bore after each use. You can't go wrong..... I only wish that Crosman would make like an 8 shot, 22 cal. pellet version of this gun. Love this gun, great for the price, great shooting. Went through tons of pellets with this, very fun to shoot. Definitely Recommend this. Love Budk, best Website around. This pistol is so cool, and that is straight out of the box. It fires spot on! I went to Crosman and bought 13 extra pellet clips, what a blast we have firing 130 rounds at a time! Just yesterday I put 7 rounds in a silver dollar bullseye at 20 yards. I kid you not! ! If you want to have fun at a great price, buy one from BUDK today. Nice gun for the money, tried to site it in from my bench rest, the best I could get was a 6" group at 20'. This pistol has a nice weight, easy to load and very accurate. It is also easyto change cylinders from BB to pellets. Just got this Gun. What a great pistol. Shoots great. I don't plan on shooting BB'S. I think I will shoot pellets only. Real acerate right out of the box. hard to beat for the price.